This rebellious listing was found by Brian. Don't look too closely at the writing. 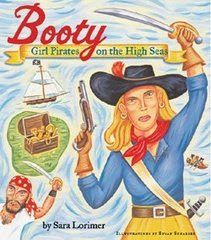 Tsk tsk tsk. 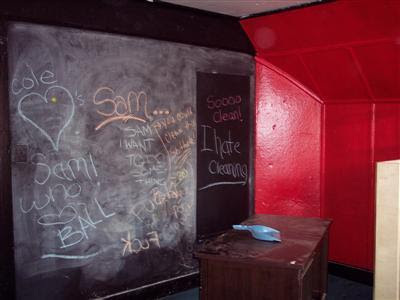 OK, so if that is a "chalkboard wall" as the listing says, why didn't they erase or wash it? The rest of the place seemed clean. Why leave one room "unclean?" It makes me wonder about that room. Perhaps it is haunted and whenever they clean the wall, the writing on the wall just reappears. I have to say, it seems to be a lovely home with one or two glaring exceptions. Like the Early American living room suite on the front porch. But wouldn't you feel like Dorris Day with those split doors? OMG I would go check out that house in a New York minute, if I were close by! It's like years ago, right after high school, a friend of mine made a fake resume and a real one...then accidentally handed out copies of the fake one, which included "effing the dog" (fully spelled out) among her proficiencies. I'd have called her up, if only to interview the person who had the nerve to write that down and circulate it to prospective employers. How about the photo in the listing with the fishtank where the woodstove should be? Anyone notice that's not right?!!? It does look like an okay house but what's with all the 1/2 cut door...can't decide if you want to keep the door open or shut? and what's with the squaty fat pictures? reminds me of other wonderful listing I've seen here. Classy. That's all I will say. I love the dustpan on the table. Classy!! Those dutch doors (what those "half-cut" doors are called)...I have a huge dent in my forehead from running into one of those when I was seven. I was out for hours. In some ways that's a cool house and those aren't Doris Day doors, they are Mr. Ed doors... big enough for a horse to pass through. Did you read the driving directions? "Take Griswold St..." that explains it, it's from a Chevy Chase movie. I love the fishtank "display" in the living room where the wood-burning stove should be. I mean, usually when you install one of those things it kind of stays with the house and is marketed as an additional feature. It's like taking the bathroom toilet or the garage door with you when you leave. I love how it lets the buyer know that the owner hates cleaning with the "I hate cleaning" written up there. Another great selling point.